With a name like My Dog Sighs, I am instantly curious. True, a shroud of mystery surrounding an artist (and a street artist no less) is no new feat; Banksy saw to that. However, I can’t help but feel that there is something special about this artist; an untainted purity that can’t be corrupted. After giving away his art for free for 10 years, My Dog Sighs – a.k.a Paul – has earned his swift rise to fame. Now an established figure on the burgeoning contemporary art scene, with a following in Israel, Japan and the UK plus three sold out shows, he has ensured his place amongst the Street Art collective. Delving deep into his artistic roots, I probe him a little about this curious name choice. 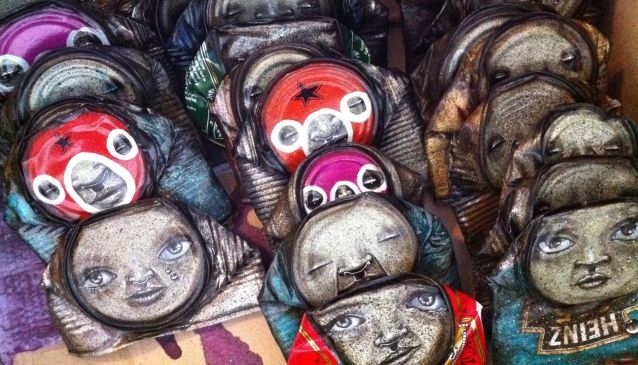 With an identity firmly established, My Dog Sighs began bringing his artistic style into fruition by collecting found materials from the street including abandoned food cans, unwanted cardboard and discarded oil drums. Transforming these rustic surfaces into blank canvases for his developing style, these ‘lost’ items became platforms for his portraiture to flourish. Naïve and melancholic, these portrayals arose from another serendipitous moment in his former career as a teacher. Presented with a portrait by a child in his class, he realised he had stumbled upon an artistic tipping point: his signature style. However, it wasn’t until he began placing his works onto the streets of London that his artistic vision came full circle. Much like his ‘discovered’ mediums, his works began to take on an abandoned quality causing viewers – or “finders” as he calls them – to interact. Picking them up, adopting them, taking them home; people discovered an inherent desire to connect with his work. Far from being ignored, however, this dynamic relationship between viewer and work only continued to blossom with the arrival of the Free Art Friday project (FAF). Capturing the eye of the BBC’s flagship arts program - The Culture Show - every Friday, without fail, for 10 years My Dog Sighs placed a single artwork on the streets to be reclaimed. An unconventional way of exhibiting art, free from the constraints of a gallery space, much like other significant street artists of the time (Banksy included) My Dog Sigh’s work began attracting global attention. Standing apart from the crowd, however, his work embodied an altruistic element, being movable and transient rather than permanently defacing public property. Undoubtedly, this reign of ‘free art’ had to come to an end; as is the same with every success story. Talking about this shift inside the gallery space (including his three sell out shows) the artist aired his reservations. Hoping to avoid this with his latest March show, My Dog Sighs has taken extra measures to prevent any artistic creativity from being quashed. Aptly entitled, ‘Walk by, Ignore me, Forget you ever saw me’, works will be positioned in provocative places for this exhibition, free from glass and frames. Interactivity has also been introduced, with viewers being able to peel back layers of cardboard to reveal a previously hidden mural. And that is when it hits me; that special quality. Regardless of where My Dog Sighs work is placed - either inside or outside the gallery space - his work remains unrestrained and communicative. In this way, therefore, his work will always be free. To check out My Dog Sigh’s work for yourself, head over to his latest exhibition at the London West Bank Gallery from the 21st to the 31st of March.